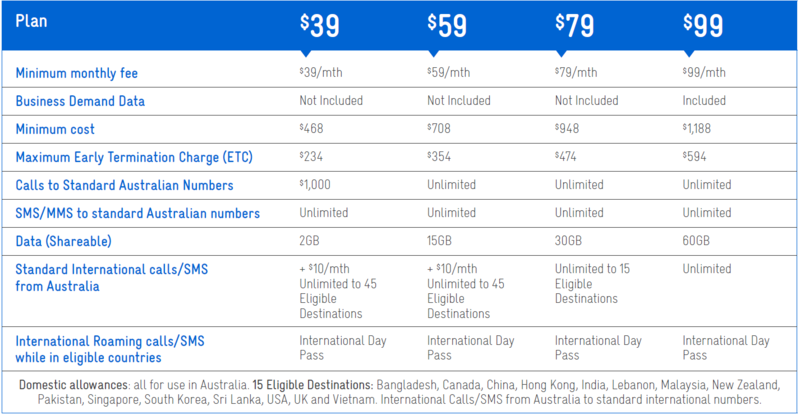 With our new Business Mobile Plans, we’ll help you keep your business moving with generous call, SMS and data inclusions for use while you’re in Australia. It means no matter which plan you choose, we’ll have your business covered. blocks of 1GB for $10 each, once you’ve gone over your included monthly data allowance. Extra Data is for use in Australia and any unused data will expire at the end of your monthly billing period. Extra Data will apply to the shared group allowance. a Business Mobile SBO Plan, SIM Plan or Casual Plan. plans per active Business Mobile plan on your account.